Just like in other industries, the patient is behaving increasingly more like a consumer. The traditional medical process has now taken on an extra dimension: the search phase. However, pharmaceutical companies don’t always see this phase as a complete part of the patient journey or as a source of additional insight into a patient. I’m buried as deep in thought today as I was relaxed yesterday when getting to eat at Hotel Mom again. It all began halfway through the soup, when she started getting upset that her father hadn’t taken his medications for high blood pressure and other ailments yet again. Just after we finished the dishes, the next-door neighbor stopped by to add fuel to the fire, venting about the crises she’s going through with her grandkids, with one having to go back on an inhaler and the other who didn’t want to keep that irritating eye-patch on, even though it helps her lazy eye. It hit me that a lot of family discussions are about medications or revolve around them. Plus, these anecdotes also make it unfortunately clear that there is no such thing as an ideal world in which the effectiveness of a drug was the result of the efficacy of the active substances in it. A lot of research backs this up as well as referencing many other elements in the ‘periphery’ around a drug that will have an impact on the therapy loyalty, such as the ease of taking or administering the drug, whether or not a person has health insurance, etc. The figure below lists just a few of these. Luckily, pharmaceutical companies have been aware of this situation for years and the traditional helplines that patients can call in case of questions or the kid-proof adhesive bandages with cartoon characters on them have been supplemented with many other innovative solutions. For example, many of them now work together with HealthPrize, a digital platform focusing on increasing a patient’s involvement in their specific course of treatment, among other things, by sending them information about their medications or rewarding them via gamification for taking these. And yet, in my opinion, there is a different challenge that lies elsewhere, which could be way in which pharmaceutical companies will distinguish themselves from one another in the future – in addition to making the patients’ lives easier, of course. Specifically, just like in other industries, the patient is behaving increasingly more like a consumer. The traditional medical process, starting with going to see a medical professional, then finding out the diagnosis, followed by a course of treatment, and then curing or learning to live with that illness, has now taken on an extra dimension: the search phase. Undoubtedly everyone is familiar with this phase when it comes to buying a new kitchen or coaching your child in choosing the most appropriate degree program to follow. A home improvement fair, an info evening at school, or an open-door day at a college or university, etc. ; any opportunity is taken to get as much information as possible. 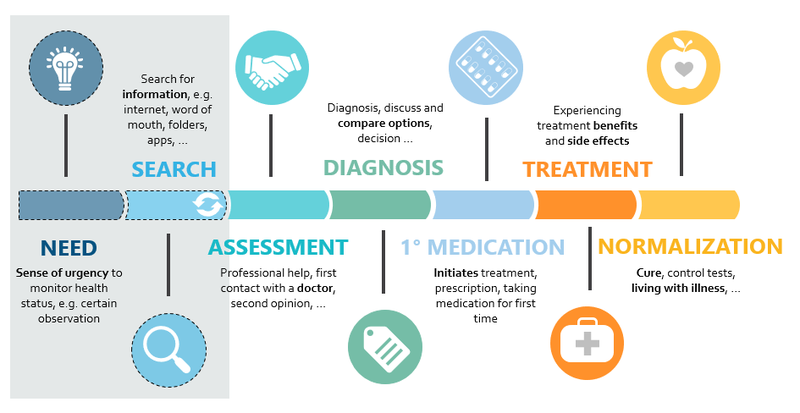 Patients also feel a need to strive for more independence, not just before they go to a medical professional, but also after in order to get more information about their diagnosis, to learn more about their medications, or to get in touch with other people suffering from the same conditions to exchange experiences, etc. The following facts prove that while this phase is clearly important to the patient, pharmaceutical companies still don’t always see this as a complete part of the patient journey or as a source of additional insight into a patient. One out of 20 Google searches is medical in nature. So, don’t be ashamed that you consulted ‘Dr. Google’ frequently when one of your kids had a strange rash on their arm, a colleague complained of pain at the back of their head, or you just wanted to learn a little bit more about those temporarily loose ear-canal stones that your GP told you to watch out for recently. When searching YouTube for ‘psoriasis treatment’, fewer than 1 out of 10 video results comes from a medical institution, a verified medical professional, or a pharmaceutical company. The Journal of Clinical and Aesthetic Dermatology came to this surprising conclusion about the second most-visited website in the world. An alternative diabetes treatment was marketed about ten years ago. It allows patients to inhale their insulin, rather than injecting it, and was seen as being less invasive. Unfortunately, the specific procedure for administering it was too cumbersome, which meant that neither patients nor suppliers showed an interest in the product. Therefore, it was removed from the market and the dizzying costs incurred never delivered on the anticipated added value. Digital technology can provide insights into how patients behave in their different search phases. For example, web scraping could generate a mood board per medicine based on the conversations analyzed on social media or patient forums. This is something that tech-entrepreneur Davy Kestens has already been doing for some time now for traditional companies with his SparkCentral. In addition, digital technology can also support patients during their search phases. An example of this is the digitalhealth.be website, which provides an overview of all the medically approved apps and mobile applications that let us monitor our health and act preventatively. Pharmaceutical companies are already fully focused on market research among their various stakeholders, e.g. hospitals, medical professionals, and patients, but the subject of the discussions is always primarily related to the commercial aspects, such as the product launch or the evaluation thereof. Investments in broader market research or more innovative ways to contact patients is recommended, e.g. in order to steer the policies for or the development of new drugs. One option is the Citizenlab, an online platform for debate around a single, central question (e.g. what do you feel is important when searching for medical information, etc.) and various subthemes (e.g. after being diagnosed, after getting the first prescription, etc.). Another option could be to set up a patients’ council, where around 100 patients could meet in person to brainstorm on various themes, similar to the increasingly popular citizens’ cabinets. In order for a pharmaceutical company to support the patient during the search phase, it is necessary to build a network with familiar stakeholders, like pharmacists, hospitals, insurance agencies, and the government, but other parties, like patient organizations, home care professionals, fitness clubs, and app developers, can also be important. After all, they can more directly distribute the information service and consultancy aspects developed by the pharmaceutical companies. In addition to this, these networks can also brainstorm on the so-called care packages, which link drugs to the various services built around these, and which individual patients can align with their own personal needs at that moment. A good example of this is the oncology outpatient, who could be helped via an educative website with customized information, a blood-draw at home, or a mobile service to assist his or her trajectory to the hospital. I plan on visiting Hotel Mom a lot more often in the future. But I hope these drug discussions can be omitted so that we can fully focus again on what really matters.